The World According to Narnia : Christian Meaning in C. S. Lewis's Beloved Chronicles is one of the books about Narnia that I picked up at the library a few weeks back. I knew I definitely wanted to get to this one and so I read through it as quickly as possible - no doubt learning some good lessons along the way due to the speed at which I was plowing through it (ha). Nevertheless, I did finish it and I thought Jonathan Rogers had a lot of quality thoughts to share with his readers. Definitely and absolutely written from a Christian perspective and to a Christian audience, Rogers draws from the tales biblical and moral lessons which the characters are learning, to encourage the readers to pursue God on their own. 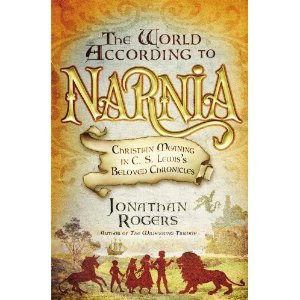 "Over and over again, the Narnia books demonstrate that imagination is more than just make-believe. Sometimes it takes imagination to see what's right in front of your face. It's the way we step outside ourselves, challenge our assumptions. Imagination, you might say, is just another word for open-mindedness. But we must not make the mistake of thinking that Narnia represents the triumph of the imagination over reason. Rather, it presented the triumph of reason and good sense by way of imagination. [In] a moment of real enlightenment for Peter and Susan [where they] had been unable to reason about the contradictions between Lucy's story and Edmund's because they were starting from the wrong set of presuppositions. As the provfessor makes clear, to say that a thing is unexpected or event unprecedented is not, logically speaking, the same thing as saying it's impossible or untrue. Rogers visits the Chronicles of Narnia book by book drawing lessons from each title. This review could become fairly long if I quoted from all of the passages I marked. Suffice it to say, I thought that The World According to Narnia was quite thought-provoking and interesting. I would be delighted to own a copy for our own home library and will, in fact, make a point of adding it to our collection as soon as possible. There are a lot of Christians out there that think that reading fiction is a less than godly practice. I disagree and think Rogers and Lewis would argue against them as well. Imagination is a gift that God has given to His people. Clearly God has an imagination and through His son He chose to teach us through stories (/parables.) We who are made in His image are gifted with the same imaginative tendencies and ability to tell stories. I think Lewis told marvelous stories, such that we can know Christ better in our own world for them. I'm definitely glad to have made the time for The World According to Narnia and recommend it to you for it's ability to make one wrestle with their own beliefs. As we say - further up, and further in! This sounds wonderful! Thanks for the review. Emotion is the enemy of faith? I think I agree. Which is why we have to be careful to base our faith on sound doctrine and theology - NOT on emotion or what "works." I think I need to add this book to my shelf and my to be read pile very soon. Sounds like an interesting book. Something I read not too long ago -- God in the Dock, maybe? -- had some of Lewis' writing about myth, and it did have that idea that myth can capture things mere reason can't. Seems like a similar idea to imagination making faith "more true."